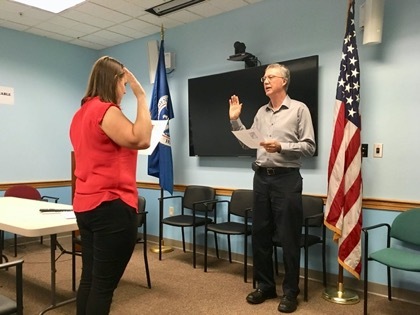 On May 24 Dale was naturalized as a US citizen in Portland Maine. So Dale and our three children are now dual citizens of Canada and the US. The decision to take out US citizenship was due to two factors: (1) It was becoming increasingly difficult for Dale to maintain his US alien residency (green card) status while living outside the US in Japan. (2) We are making plans to retire in Maine, Ann’s home area, perhaps by 2022. The naturalization process with the US Citizenship and Immigration Service includes three steps: (1) fingerprinting at a USCIS facility (which Dale was able to do in Seoul, South Korea); (2) an interview and knowledge test of US history, government, and English ability; and (3) a swearing in ceremony. These are typically three different appointments. However, Dale was able to complete the last two steps in one day. Ann had fun watching Dale being sworn in. In some of his spare time Dale has been enjoying tracing his ancestry. Interestingly enough, one grandmother and a number of direct descendants 3 or more generations back were Americans or born in the US, so perhaps Dale is returning to some of his roots.